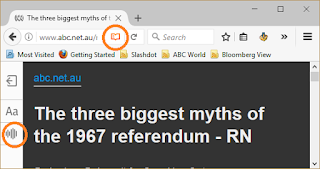 Get Firefox to read articles aloud. An open book icon (marked) appears next to the URL when Firefox detects a long-read article. Click on the icon to render the page in reader mode. In reader mode, you can alter the text formatting to make it more ... readable. You can also click on the waveform (marked) to have it narrated. Enter "about:config" in the URL bar and press 'enter'. Right-click on 'media.webspeech.synth.enabled' and toggle it to 'true'. Tested on Firefox 53, 64-bit, Windows 10. Voices on different systems may vary, but I prefer Microsoft Default Zira. The default male voice is a bit too much like MC Hawking. No need for add-ons anymore! I'm posting this because I could find no similar how-tos on the web. Hope it helps.